Let’s face it I still have a sweet tooth. My sweet tooth did not magically disappear after my GP diagnosed me with diabetes. What did change, however, was my awareness of what I was eating and the carb content of food. For those that aren’t aware, carbs convert to glucose. So we must limit the amount we eat to avoid high blood glucose readings. I have been on a mission to find reduced carb/reduced sugar treats so that I can still indulge from time to time. Luckily, there is a forever growing market for low sugar and low carb products. Here are some of my favourite brands and treats. I purchased these treats from a wonderful small business I discovered on Instagram called Sweet Victory Products. They stock a broad range of brands that offer reduced-sugar/sugar-free products to support individuals touched by diabetes or autism. They were kind enough to provide me, and diabetesand.me readers, with a 10% discount for the first order. To redeem this discount, you can use the following code: DAM10. Diablo offers an impressive and enticing low-sugar confectionery range. They add no additional sugar in their products, which means that their products will be lower in carbs than the traditional versions. 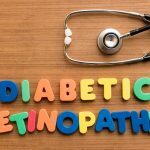 Typically, they use maltitol as a sweetener, which is a sugar substitute that should not have as much of an effect on your blood glucose levels. They sell a variety of low sugar products such as chocolates, cookies, wafers, sweets, muesli bars, cakes, and spreads. Diablo offers a range of sugar-free cakes. One of my personal favourites is their chocolate cake. One cake provides roughly five servings. A serving is around 9.5g of carbs, 76 calories, 4g of fat and 0.5g of fibre. Each bite offers a deliciously sweet chocolate fix. It tastes very similar to your typical chocolate cake and goes fantastically well with a nice cuppa. The texture is crumbly and can be a bit on the dry side, but don’t let this put you off, adding some cream or a having a hot drink to accompany the cake will do the trick. This cake gives off a delicate and enticing chocolate scent tempting you to have more. 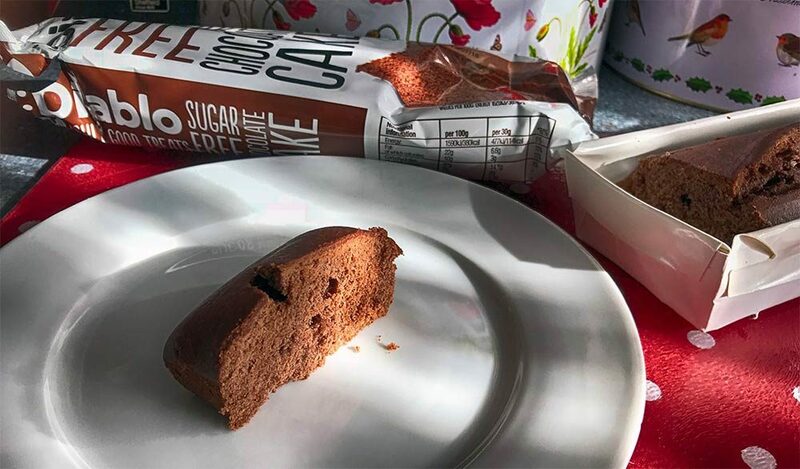 Chocolate cake is an old favorite of mine, so I am so glad there is a sugar-free alternative that does not compromise on the taste. At 9.5g of carbs per serving, one slice does not spike my blood glucose levels. I can have roughly 10-15g of carbs for a snack and 20-30g of carbs for dinner and know I will stay at a controlled level. So this cake fits well within my threshold. 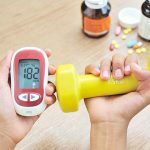 If you aren’t sure what your tolerable carb amount is, I recommend testing with a blood glucose meter to find out! A serving is only 76 calories. As the serving is small it can be tempting to have another slice. Two or three slices equals 19-28g of carbs and can easily spike your blood glucose levels if you consume too much. A considerable amount of these carbs will come from sugar alcohols (sugar substitutes such as Stevia). Sugar alcohols are not completely absorbed in the digestive system and as a result are less likely to cause a spike in blood glucose levels. However, everyone is different, and some people still experience a spike. If having just one serving at a time is doable, this offers the perfect chocolate cake fix. As mentioned previously, the cake is mildly dry. The serving size is quite small, so one slice on its own is fine. If you want to have a bigger portion, I recommend serving the cake with cream. Do not be put off by this as it does not ruin the taste and is easily solvable if it is problematic for you. Overall, this cake gets a big thumbs up from me and is one of my go-to treats that I occasionally allow myself. I recommend giving it a try if you are missing chocolate cake. You can purchase the Diablo Sugar-Free Chocolate Cake from Sweet Victory Products. On Diablo’s website, they refer to their treats as devilishly good. Devilishly good is the perfect description for this hazelnut chocolate spread. Per 30g serving there is 14.7g of carbs, 148 calories, 11.1g of fat, and 0.84g of fibre. The spread tastes very similar to an old friend called Nutella. Remember him? Or her, whatever your interpretation/preference. That little friend we turned to with spoon in hand on a cozy Friday night in front of the tv. Doesn’t sound familiar to you? Ok, don’t judge me. I loved Nutella… I think you get the picture. This insight into my weird habits explains why I was so excited to try this product, and why it is one of my favourites. To taste so similar to Nutella is pretty impressive. It holds that rich chocolatey-hazelnut flavour. The smooth and creamy texture just glides down. Boy, I am salivating just writing this! And to top it all off, I just love the sweet smell of chocolate and hazelnuts. They make a great pair. I have a confession to make. I just stopped writing to grab a quick teaspoon of this spread. I have a problem. But so does someone else in my household, as my jar seems to be less and less full each time I go to it. The taste is divine. I have zero complaints about the taste, texture or smell. 10/10 from me. It has 8.6g less carbs than Nutella per 100g serving. It is a versatile product and has many uses. You can enjoy it on a low carb pancake, make a hot chocolate out of it, spread it over low carb bread, use it to top low carb cupcakes or low carb waffles. The possibilities are endless! Although there is a reduction of 8.6g of carbs compared to Nutella, there is still 14.7g of carbs per 30g serving. One serving is my threshold. I absolutely cannot overindulge in this product as it will spike my blood glucose levels. To be fair, this is probably a good thing. As I could eat a bucket full of this stuff. This product is quite high in calories and fat, so it is important to have this as a treat rather than on a regular basis. I think it is pretty obvious that this spread is a winner for me. I adore it! 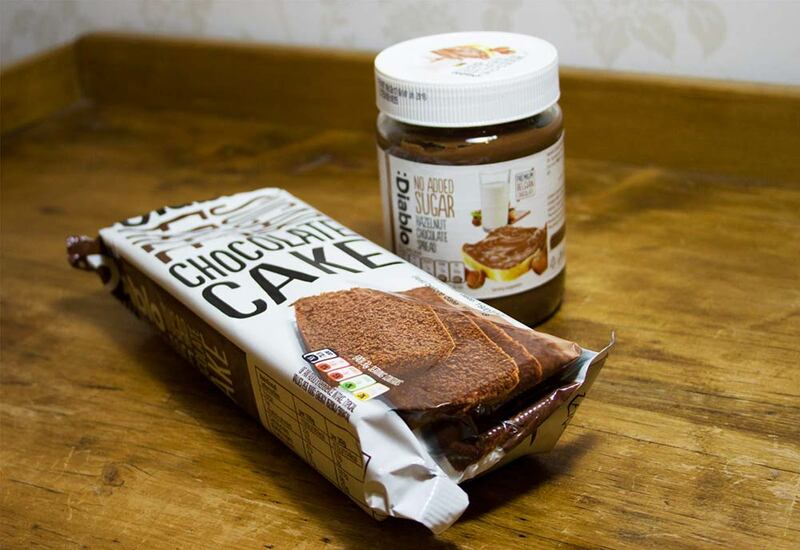 If you miss Nutella and want a reduced carb option, then this is the product for you. 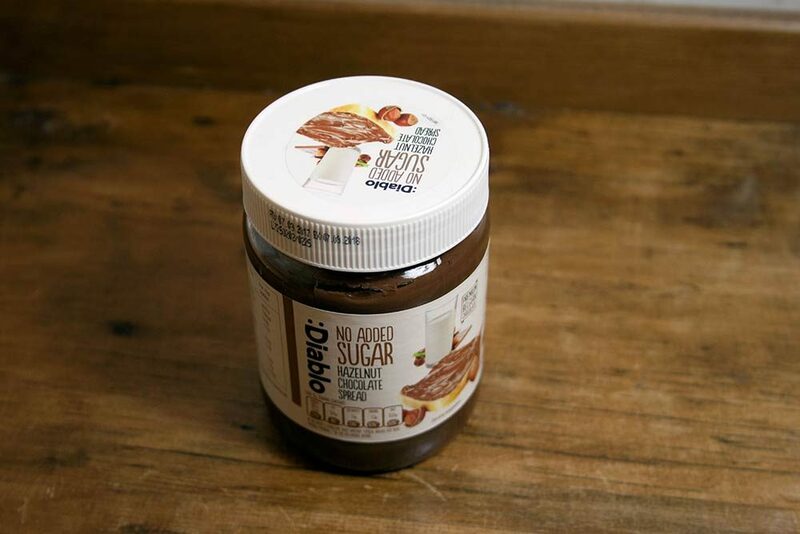 You can purchase the Diablo Sugar Hazelnut Chocolate Spread from Sweet Victory Products. de Bron Lifestyle Candy, previously known as De Bron Sugarfree, aims to offer sweet treats to suit a variety of lifestyles. These include lactose-free, gluten-free or sugar-free lifestyles, and according to their website, aim to introduce candy that is suitable for fitness lifestyles. For example, sweets that are suitable to have before, during or after a workout. They offer products that are sugar-free, have no added sugar, dairy-free, veggie, bio-organic, gluten-free, and they strive for fewer calories. They stock a variety of sweets from marshmallows to liquorice to chocolate. These marshmallows are sugar-free, gluten-free, and dairy-free. The whole bag (100g) contains 214 calories, 0g of fat, 80g of carbs, 77g of which is from sugar alcohols (sweeteners), and 4g of protein. And let me tell you, next to the Diablo Chocolate Hazelnut spread, these are my favourite. This candy is another product that tastes exactly like, if not better, to its sugary counterpart. These marshmallows are sweet and fruity in taste, and their texture is light and fluffy. There is nothing noticeably different between these and full sugar marshmallows. In fact, I prefer them. I’ve always liked marshmallows, but I used to dislike the dry-powdery feeling in my mouth after eating them. The de Bron Marsh Mallows don’t leave a powdery residue. You can give these to a family member or friend without telling them that they are sugar-free, they’ll never know the difference. These are delicious. They are low in calories, low in fat, they are gluten-free, dairy-free and sugar-free. They are suitable for many lifestyles. They are a great topping for my low carb hot chocolate. The whole bag is 80g of carbs. 77g of the carbs is sugar alcohols (sugar substitutes). Sugar alcohols should not affect your blood glucose levels as much. However, it has been known to spike some people. So you must be mindful of this when trying these. I recommend having a small handful of marshmallows and testing your blood glucose level an hour or two later. That’s what I did, and luckily I was able to tolerate these without a spike. Eating too many of these may send you to the loo. Luckily, I ate these in 4 servings. If I had eaten the whole bag in one go (I do not recommend this!) it could have been dangerous. In my last order, I purchased three bags of these. I like to always have a bag around as these make a great treat. I recommend trying these. 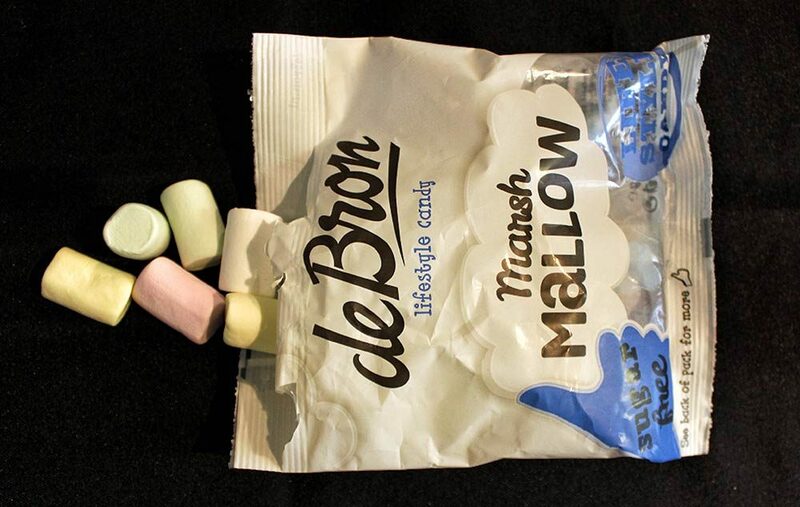 You can purchase the de Bron Lifestyle Candy Marsh Mallow from Sweet Victory Products. Finally, some sugar-free wine gums! I’ve never been a massive sweetie fan. I’m all about chocolate. But, I have been known to enjoy the occasional sweets as a treat. I was looking forward to trying these as it had been so long since I had eaten anything like this. de Bron Lifestyle Candy Wine Gums certainly satisfy sweet cravings. They have a strong fruity scent, with a sweet and fruity taste to match. They have a chewy texture, more much chewier than the regular wine gums. The chewy texture wasn’t a problem for me, and, I enjoyed eating them. It provided me with a much-needed break from chocolate treats. 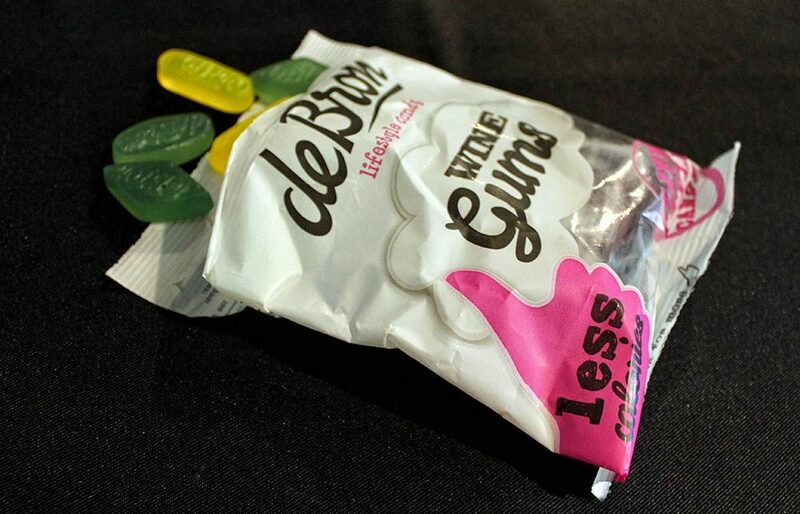 The de Bron Lifestyle Candy Wine Gums are gluten-free and sugar-free. Per 100g, they have 235 calories, 0.2g of fat, 87g of carbohydrates and 77g of which is from sugar alcohols, 0g of protein and 0g of salt. They are tasty sweets and satisfy my sweet cravings. They are virtually fat-free and I love that they contain 0g of salt. As I have already mentioned, these are rather chewy. They do stick to your teeth a bit, but this didn’t bother me. However, if you have difficulty in chewing these may be a challenge. Many products that use sugar substitutes can cause a laxative effect if eaten in large quantities. I recommend following the serving suggestion on these to avoid any chance of that happening. If you are a fan of wine gums, I reckon you’ll like these. They are tasty, and the only real difference you’ll notice is the texture. If the chewiness doesn’t bother you, these are a great treat. You can purchase the de Bron Lifestyle Candy Wine Gums from Sweet Victory Products. Virginias products are sugar-free, fructose-free, and some are gluten-free. They offer a variety of biscuits, wafers, chocolate tablets and candies. Virginias is a Spanish brand. They aim to deliver great tasting and high-quality products. In replace of sugar, Virginias use Maltitol or Stevia. What can I say? These biscuits are superb. The orange chocolate flavour is my favourite. However, the dark chocolate is also tasty. They are scrumptious on their own or dunked into tea. These are a real treat. Both biscuits are crunchy and are covered in smooth chocolate that melts in your mouth. The chocolate orange flavour has the perfect balance of chocolate and orange. The dark chocolate flavour is slightly more bitter, but if you are a dark chocolate lover like me, these will be right up your street! They have a mouthwatering smell, with scents of oats, wheat, and chocolate. They smell as good as they taste. Per 100g (the whole packet is 120g) there are 61g of carbs, 33g of which comes from sugar alcohols (sugar substitutes), 461 calories, 3g of fibre, 0.25g of salt and 7.4g of protein. These biscuits also have six added vitamins. These include vitamin A, vitamin D, B1, B2, B5, and Folic Acid. How awesome is that? They are delicious! The perfect substitute for a digestive biscuit. Can be eaten on their own, or taste even more delightful dunked into a hot drink. They stock a variety of flavours of this biscuit, I am excited to try more! I have to confess, one evening I did ever-so-slightly overindulge and accidentally ate half a packet. I was mindlessly eating them. However, I must admit that I did pay for my sins. I had a bit of an upset tummy for it, but this might not happen to everyone. In fact, it is a blessing in disguise as it stops me from eating too many. After consuming half a packet, my blood glucose had risen a considerable amount. Admittingly it wasn’t horrendous, but it had risen to 8mmol. If that had been a normal packet of biscuits, I probably would have a blood glucose reading of 16-20mmol. Once I had learned from my sin, I ate a sensible amount of these biscuits, say one or two at a time, and they had little to no effect on my blood glucose levels. In conclusion, I recommend being mindful of the amount you eat of these, just to avoid the risk of an upset tummy or a rise in your blood glucose levels. Other than that, these biscuits are a delicious treat. They make the perfect alternative to digestive biscuits. I recommend giving some of the flavours a try! The next flavour I am going to try is the chocolate almond one. 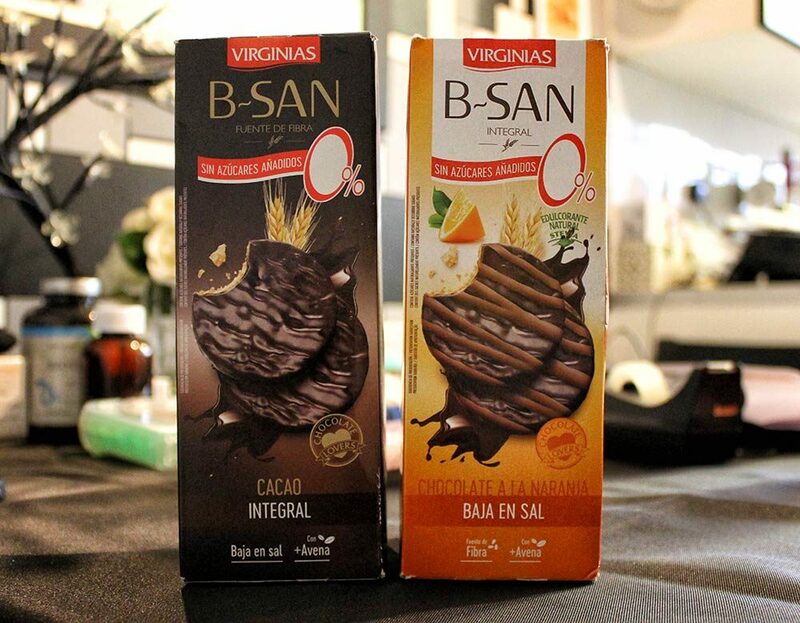 You can purchase the Virginias B-San Orange Chocolate Digestive Biscuits and Virginias B-San Dark Chocolate Digestive Biscuits from Sweet Victory Products. My other half and I had the pleasure of sharing this chocolate biscuit. To both of our delights, the biscuit’s smell reminded us of dairy-milk chocolate. You know that gorgeous chocolatey smell? Before even eating it, we were already excited to try it! The texture was crunchy, and the chocolate instantly melts in your mouth, giving an added creamy texture. The taste was sweet, chocolatey and the biscuit had a slightly nutty flavour. Delicious! The biscuit has roughly 10.6g of carbs, 4.8g of which is from sugar alcohols, 70 calories, 0.7g of fibre, 3.2g of fat, and only 0.03g of salt. What isn’t to love about this biscuit? The taste, texture, and smell are just divine. It is low in calories, salt and sugars. As this is an individual bar, it had no negative effects on me such as a laxative effect or a rise in my blood glucose levels. These are perfect on the go, in lunch boxes or as a snack. There isn’t a lot to be mindful of when eating this. If you were to purchase several of these, I would advise eating no more than 1-2 at a time. Otherwise, you will be a risk for an upset tummy or a rise in your blood glucose levels. Feeling peckish? 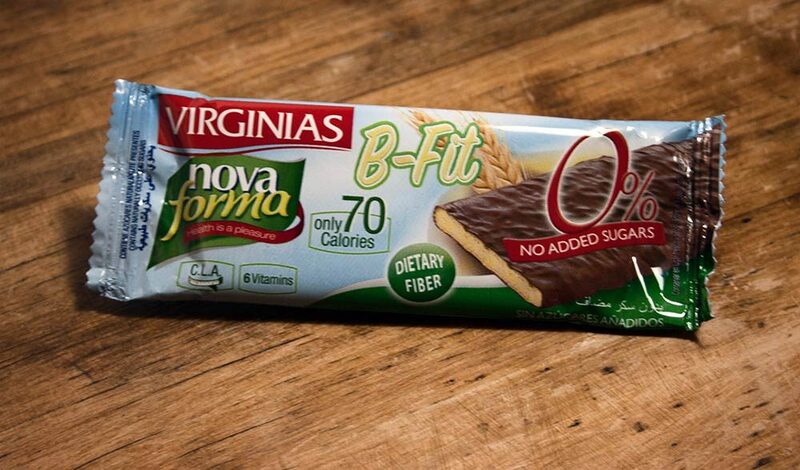 You can purchase the Virginias B-Fit CLA Chocolate Covered Biscuit from Sweet Victory Products. A delicious, conveniently snack-sized, pack of 4 wafers that can satisfy any sweet tooth. They have a delightful praline-chocolatey smell. The texture is typical of a wafer, with a crunchy but melt-in-mouth biscuit and a soft chocolate center. Virginias have put the perfect amount of chocolate on the wafer, not too thick and not to thin. The biscuit and chocolate complement each other well, with neither overpowering the other. The taste is sweet and, with each bite, you get a pleasant hit of cocoa. Each wafer consists of 5.8g of carbs, 50g of calories, and 2.8g of fat. Each wafer is only 5.8g of carbs! They do not spike my blood glucose levels, and I can have up to two wafers without worrying. They taste just like regular wafers to me, I did not notice a difference even though they are sugar-free. Small-sized treats easily tempt you to eat larger quantities. As with most sugar-free products, if you were to overindulge, they can have a laxative effect. These are perfect to keep as quick on-the-go snacks or to add to a packed lunch. Personally, I was able to remain disciplined with the amount I ate. They are sweet and satisfying, so I found two was the perfect amount. Feeling peckish? 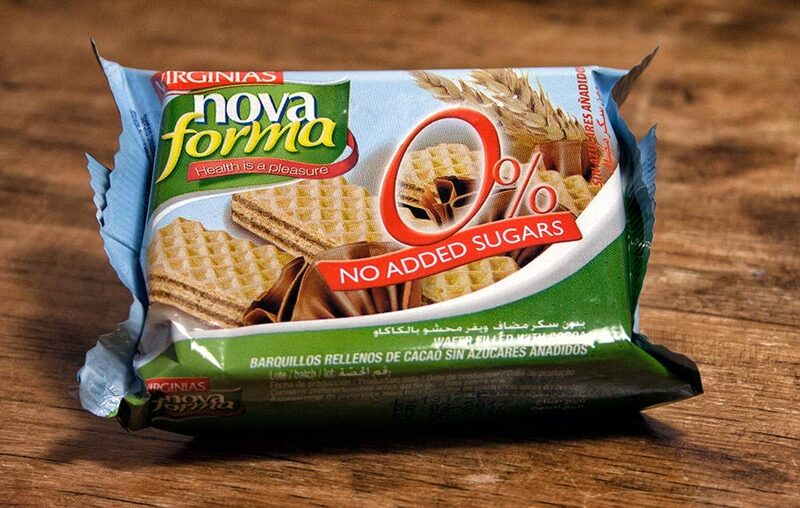 You can purchase the Virginias Cocoa Filled No Added Sugar Wafers from Sweet Victory Products. I hope you have enjoyed reading my review of these products as much as I enjoyed eating them! If you have any suggestions for new products to try or any questions please feel free to comment below. I would love to hear from you.